Hi everyone.today was the first day I felt it. That day is on its way, the one that all the hustle and bustle is about. Today is the first day I went to town and saw the new lights ,heard the new songs, decorations everywhere, everything is geared up for CHRISTMAS! I love this time of year, all the tempting, enchanting adverts, and talking of adverts, where have my alien family gone? I thoroughly enjoyed them last year. Bring them back! 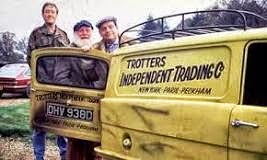 And I so miss Only fools And Horses, sitting down to watch the Christmas special with the family. I have watched them all. But I am loving the new Christmas advert for Sainsburys, so moving, and a reminder of hope that we could get along one day. Based on a story of a truce in no man’s land between English and German soldiers. Well done to Sainsburys too for giving a donation to the Royal British Legion. Have you bought your chocolate bar yet? And who doesn’t love the 1st of December, the big countdown! getting the children their advent calenders, there is always a favourite one, there will be loads of little girls wishing for the one from the film “Frozen” this year. I know this song off by heart now, my grand daughters are always breaking in to song and doing all the moves!. But have you seen the best advent calenders? the ones for us grown ups? I have added a few and I am hoping for any one of these…………. This one from Selfridges, 24 days of top brand fragrance. A hefty £85.00 Anyone who gets one of these is truly spoilt! But to be honest I would just be happy with an advent calender that I could eat, completely nut free! Because that’s what Christmas is really all about right? The children, and I cant wait! Previous Post JUMP TO IT! Next Post M&Co ITS ON MY CHRISTMAS LIST!